While computer and digital arts are trending rapidly, Artware has been insisting in serving the community in Oneonta, along with the experience and profession of its staff members for years. As soon as you step into the store on Main Street, you will be attracted by the colorful greeting cards and children’s color books on the rack. When you walk inside, you cannot agree more with me that the variety of professional art tools and materials provided here can hardly be found anywhere in town. From papers, brushes, paints, to frames, Artware does not only offer customers numerous high-quality options to choose, but also practical and professional solutions to deal with their problems. The store does not have any special decorations; however, it brings multiple colors to the community. In 1980, Ms. Betsy Westad Cunningham started her business alone in the garage of her house. Although she has relocated twice, Oneonta is still where she decided to stay. She explained that “I like it here. I’m very happy here,” simply without any other reason. As an artist, she is devoted to helping students, the local artists, and even people that are out of the area to find what they need and solve their problems. She is pleased that most of the people they deal with are delightful while seeing new and old faces frequently. Throughout 37 years, from a one-woman operation to a five-member crew, Ms. Cunningham called it a steady growth. She is not sure if this was what she expected, but this is definitely what she enjoyed and wanted to do. Although there might be challenges coming up, she believes that there is always something to learn. Over the years, Artware has been playing a supportive role to help artists learn how to deal with problems and assist professors and students art tools and materials. Even though computer and digital arts are becoming more popular, Ms. Cunningham believes that working on traditional art is essential for an artist to build a strong basis in order to be in the art field. “If the electricity goes out, you should be able to still draw.” Ms. Cunningham said. 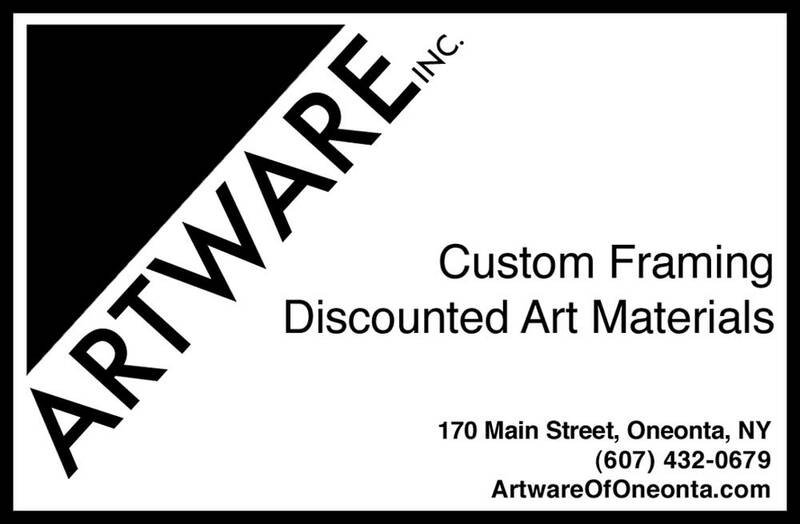 Despite the black triangle which is the logo of Artware, Ms. Cunningham thinks her staff represents Artware. The crew is formed by five experienced workers: Regan Baudelaire, Erin Hill, Susan Blass, and Bill Austin. Do not hesitate to come in with any questions; they are very friendly and always willing to help! What does Oneonta mean to you?